Budweiser advertising in Canada during the Super Bowl this year included “Blackout”, a tribute to Canada’s ice hockey hopes. 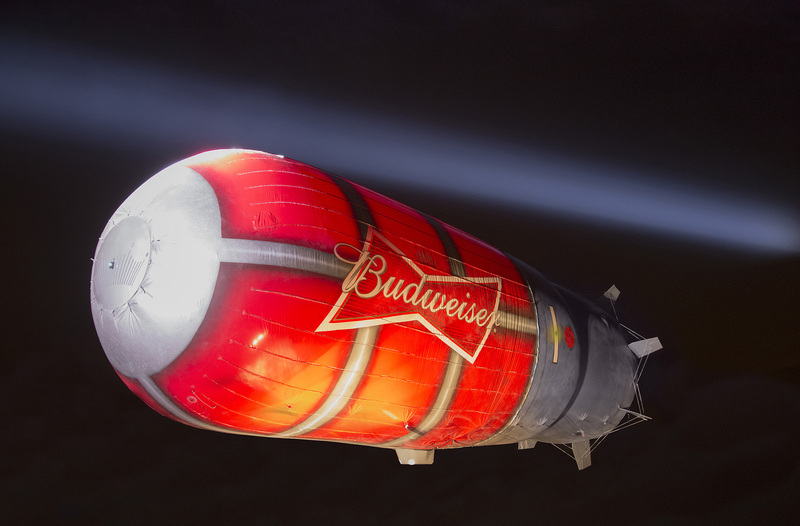 A Budweiser blimp shaped like a hockey goal light is seen floating over Canada after a game-winning goal and quickly, there’s a black out around the world, except in Canada, where celebration ensues and the blimp lights up the streets. The integrated campaign includes goal lights made available to fans, complete with an SD card that hooks up to a smart phone. When your team scores, the light goes off. A real 80ft flying blimp, like the one seen in the spot, is flying above major Canadian cities during the Sochi Olympic games. When the Canadian hockey team scores, the blimp lights up and make noise. The Blackout campaign was developed at Anomaly Toronto by executive creative director Dave Douglass, associate creative directors Craig McIntosh, Jaimes Zentil, copywriter Jesse Hornstein, producer Leanne McLellan, business director Brent Rivard, group account director Dion Arahalli, account supervisor Allison Cornford and account executive Vanessa Cote. Design and animation were produced at Mill+ by animation director Ben Smith, executive producer Zu Al-Kadiri, producer Richard Schwab, director of photography Adam Carboni, production supervisor Phil Fyfe, production designer Greg Loewen, and stylist Katrina McCarthy, with editor Ryan McKenna and Lemonade Films producer Ted Herman. Post production and VFX were produced at The Mill by producer Krystina Wilson, shoot supervisor Tony Robins, 2D lead artist Nick Tanner, 3D lead artists Ruben Vandebroek, 2D artists Bruno de la Calva, John Mangia, Georgie Ford, 3D artists Wyatt Saverse, Greg Gangemi, Kevin Couture, Ylli Orana, Olivier Varteressian, assist Dae Yoon Kang, matte painting team Marco Iozzi and Mark Ross, colourist Fergus McCall, assistant producer Juan Handal and colour producer Heath Raymond. Sound was designed at Human Worldwide and mixed at Sound Lounge.